Need a giftcard? Giftcards are available for your personal or business relationships. 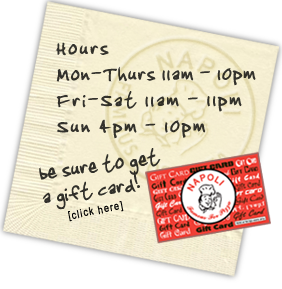 Get your giftcard at Napoli Pizzeria today. Please order your gift card by calling us at: 707.644.0981. Giftcards can be loaded in any dollar amount you choose. We will require a signed Credit Card Authorization Form(33KB) via fax 707.644.9270 to process your order. Please call us before sending your signed Giftcard Credit Authorization Form. Orders placed before 3:00pm PST, Monday through Friday, usually ship the next business day except for holidays. Orders placed after 3:00pm PST or on weekends usually ship within two business days. I've been eating here since the early 80's. I've met Antonio (Tony) G, the original owner, his sons and most of the wait staff. They are truly awesome people. The food...can't say enough about the food. I go at least once ev… - H. S.